Nonetheless, it is recognized in the same document that the system of dollar payments tends to be spread all over the planned economy, which is in contradiction with the goals previously announced for the Central Bank.2 Actually, one of the main features of the Cuban economy is the contradiction between the existence of a Central Bank and the ongoing dollarization of the economy. Neither the long stability of the peso against the dollar nor the economic recovery over the last five years have prevented the dollar from becoming the preferred mean of exchange. Although domestic savings are almost negligible, the dollar has also gained ground in this important economic factor. After legalizing the holding of dollar balances in 1993, the Cuban authorities have never hidden their misgivings about opening this door the citizenry. Once in a while, a prominent member of the economic cabinet states that the Cuban peso should be restored as the only mean of exchange. However, the reasons behind anti-dollar statements seem to be political rather than economic. The elite is afraid that dollarization would continue to zap the basis of its power; they fear that the dollar could sever the traditional tie between political loyalty and economic welfare. The government has kept a tight monetary discipline and undertaken some measures to foster the domestic use of the Cuban peso as well, while promoting the use of the dollar throughout the public sector. Indeed, a distinctive feature of the Cuban dollarization is its sponsorship and promotion by the Cuban government. Such a policy has resulted in monetary and exchange rate dualism, which hampers efficient resource allocation and introduces harmful distortions into the price system. However, instead of reviving the Cuban peso, the authorities have decided to end the dualism system by spreading the use of the dollar all over the planned sector. 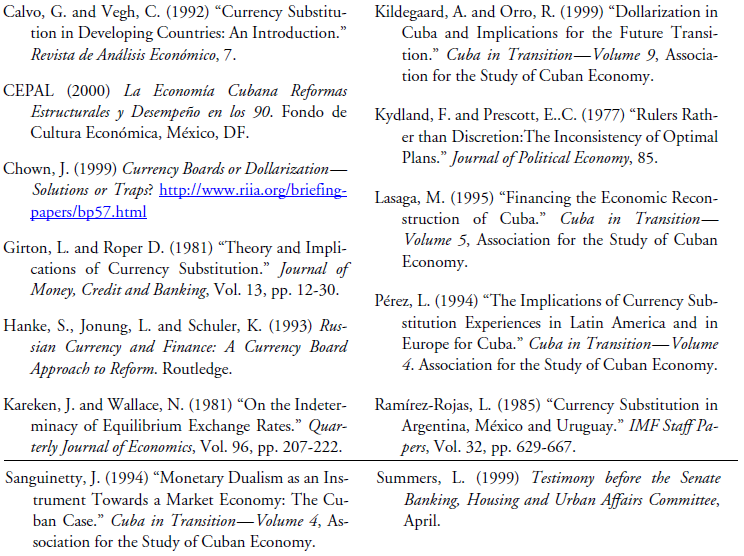 This paper is intended to update the an earlier by Kildegaard and Orro3 on Cuban dollarization with the latest economic developments on the island. Although the current paper continues on the same spirit of the earlier one, it offers a more thorough analysis of the reasons compelling the Cuban government to bolster dollarization. The paper is divided into two parts. The first part explains the reasons for the Cuban government’s fostering of dollarization and describes recent developments in this process. The second part presents our point of view on the advantages for Cuba of maintaining and enhancing dollarization. Finally we present the conclusions. WHY DOES THE CUBAN GOVERNMENT BOLSTER DOLLARIZATION? Despite the fact that the roots of dollarization in Cuba stretch back to the 1980s, when the government set up a commercial network in dollars, the phenomenon blossomed after the liberalization of the use of dollars in 1993.4 In 1994, Cuba was undergoing its worst economic crisis ever. Production of consumption goods had fallen sharply fell and the devaluation of the Cuban peso in the black market seemed to be bottomless. The domestic currency had been almost driven out as a mean of exchange by the dollar. At that time, the population had already defied the remaining restrictions imposed by the authorities regarding the exchange of dollars. The number of citizens using dollars rose every day because of remittances and a thriving black market linking Cubans with foreign tourists. Finally, the authorities realized that such authoritarian policy was pointless and decided to overrule the restrictions keeping ordinary citizens from trading and buying with dollars. The curtailment of Soviet subsidies and the desperate need for new sources of revenues in foreign currency pushed structural reforms in the economy during the 1990s. Within the new economic model, tourism ceased to play second fiddle and became the engine of the economy. Since the very beginning of the reform process, it was clear that the tourist sector would rely on foreign investment, so that the government could prevent its foreign partners from taking exchange risks. Investors would have never accepted operating and dealing in Cuban pesos, a currency that can barely hold a flimsy equilibrium against the dollar. That is why the authorities chose to use the American currency as an exclusive tool of payment and unit of account for the tourist sector. The state monopoly over the tourist sector and foreign trade, as well as the absence of government debt, led to another interesting feature of the Cuban economy: there is not need for seigniorage whatsoever. Unlike other developing countries that heavily rely on inflationary tax, the Cuban government can rule it out. Moreover, indiscriminate monetary issue can only bring disadvantages. Among the possibilities stemming from government ownership/co-ownership of the tourist and foreign trade networks, the Cuban authorities have the power to fix high markup prices on the consumption goods sold in the dollarized network. Of course, revenues from tourism should be shared with foreign partners but, on the Cuban side, only the government is entitled to participate in this business. From the economic point of view, dollarization has not added any new problem or distortion not existing when Cuba was inserted in the inefficient system of economic relations centered on the Soviet Union. The monetary dualism and the co-existence of two exchange rates drag on the resource allocation and affect the purchase power of the population but not significantly more than the former planning and economic control mechanisms did. The Cuban authorities have recognized the bias connected with the exchange rate dualism. The population buys dollars at around 20 pesos per dollar (a rate set by the market) but the government sets a rate of 1 to 1 for many transactions within the planned sector. When an exporter needs to buy inputs from a domestic firm, it needs to first exchange dollars for pesos at the official rate. Likewise, importer firms are entitled to buy dollars at the very advantageous and unrealistic official rate. But such an arbitrary parity is not a recent phenomenon. It started long before the reform program of the 1990s. This behavior is the best choice for the Cuban authorities. Scrambling to rescue the Cuban peso does not seem to be a viable choice. The Cuban economy has always been remarkably open, so even the government needs to import a substantial amount of consumption and capital goods. The government has a permanent need for dollars and the idea of embarking on a new adventure, where the dollars previously collected would be traded for pesos and then reconverted into dollars, does not appear very alluring. It is easier by far to operate in dollars and ensure that no losses are incurred in exchanges from one currency to the other. It has been alleged that dollarization hinders the development of the tradable goods sector. But the development of the Cuban external sector over the 1990s rebuts this assertion. First, it should be noted that the devaluation game, which has not proved to be very effective in other countries, will not necessarily provide competitiveness in an economy with a well educated labor force earning miserable salaries. And second, in open economies heavily relying on tourism, even non-tradable goods, like real estate, turn into tradable ones. While expanding the dollar´s scope, the authorities refuse to take the peso out of circulation. It is a wise decision as the domestic currency guarantees— thanks to the absolute power of the state to set prices and salaries—some protection against external shocks. Those who state that dollarization dampens competitiveness forget that the Cuban peso is still circulating and is a powerful tool in the hands of the authorities to absorb negative external shocks. The Cuban workers´ salaries in pesos are entirely fixed by the government, so it has no domestic liability in dollars. Indeed, the population can buy dollars in a free but very limited market, which only reflects the purchasing parity between some domestic and foreign consumption goods. The government is not committed to defend this parity, and, in the event of some adverse external shock, it does not have any obligation to maintain a predetermined level of salaries in dollars. Monetary dualism provides another subtle and profitable option to the government. As every single Cuban worker in joint ventures must be hired through the state, the latter charges foreign partners an amount in dollars for each worker employed. Most of these dollars are converted into pesos at the rate of one to one, and then delivered to the workers in the form of salaries, along with a small compensation either in dollars or baskets of consumer goods. The concept of monetary policy has adopted a peculiar form in Cuba. It is not used to smooth economic cycles by manipulating interest rates, but rather to ensure that salaries do not fall down to the point of deterring citizens from working, as it happened at the beginning of the 1990s. The interest rate is a variable quite divorced from the capital investment process, which is centrally determined and subject to the stunted domestic saving and some resources provided by foreign partners. As the path followed by the authorities to eliminate monetary dualism implies bringing public firms into the dollar´s world, we do not expect the investment process to rely on the Cuban peso in the short run. The political costs attached to dollarization spur sporadic statements by members of the elite about the necessity to restore the Cuban peso as the unique currency. But such statements are rather the result of the government´s concern that dollarization is wiping out the traditional bonds between political loyalty, reliability and wealth. The authorities grunt and complain when they see how many ordinary citizens, not linked to the communist party at all, are able to buy in shopping centers and go to restaurants formerly reserved for tourists or highly ranked public officials. In spite of these statements, the government has confirmed in public its commitment to dollarization. Without any doubt, the government is empowered to make illegal the holding of dollars but this option would be extremely costly: the foreign exchange black market would return and prisons will be filled up again with citizens accused and convicted of dealing with dollars. As the objective function governing the Cuban economy is the optimization of the benefits of the State, the government would unlikely bet on the domestic currency. In spite of its protracted stability against the dollar, the Cuban peso does not yield interest and its international demand is null. The only way for the Cuba peso to gain some quality is through capital and money markets. But Cuba has no conditions to set up such markets, given the government’s reluctance to liberalize the investment process: not even real estate and car markets are allowed. Although the Central Bank undertook some measures intended to encourage remittances and other payments in euros, the authorities are quite far from being willing to abandon the dollar or return to the peso. It is noteworthy that dollarization means a foreign currency—dollar, euro, whatever—driving out the domestic currency. Because of the persistence of the embargo, it is easier and less costly for the Cuban authorities to operate in euros rather than in dollars. Cuban policymakers have stated their interest in finding a fair exchange rate for the peso. But, while reading CEPAL´s works, it looks that the problem is reduced to some analysis and estimations, where the multiple barriers set by the government do not matter at all. How can the policymakers find the actual value of the Cuban peso when even real state and car sales are forbidden, bank savings are unlinked from investment, and the government halts the development of the private sector? Anyhow, if such parity were found, nothing could be done to offset dollarization and the authorities would likely be the first ones repudiating the Cuban peso. Cuba is still far away from being market economy country. However, sooner than later the country will start a decisive economic reform and the topic of exchange rate and monetary policy will necessarily be discussed. The prospective exercise implies, as in other many cases, the never-ending debate between predetermined rules and monetary authorities with discretionary power. There is a plethora of works on the Cuban economy addressing this topic, most of them written based on the transition experiences of Latin America and Western Europe. Nonetheless, it is worth mentioning that many of those studies were written before the financial reform in 1997. They also relied on the assumption—not always explicit— that the political and economic transition would begin on ground where the model inherited from the former Soviet Union prevailed.9 Even though the Cuban economy is still subordinated to politics and the need for preservation of the Communist party, there have been many significant changes that are paving the road for a transformation to a market economy regime. Such changes, and on doubt others, will constitute the initial conditions in the future and will influence transition policies. The evolution of dollarization has bound the possible scenarios for Cuba in the future, but dollarization should not be seen as a policy of last resort to halt inflation and restore macroeconomic equilibrium.11 Actually, the country has enjoyed a long period of exchange rate stability and inflation is under control. The choices left to Cuba for the future are uprooting dollarization—which would likely lead to a floating currency—or completing the process started by the communist authorities. Before making the final decision, policymakers should remember that a floating exchange rate behaves poorly under dollarization. Snatching away the U.S dollar is a necessary condition for floating system to work and the costs linked to such compulsory option should be also taken into account. Nowadays, as a result of the transformations that have occurred since the end of the Soviet era, reverting dollarization would be extremely costly. The current political system does not seem to be on the verge of collapse. It should be expected that dollarization will continue to take root in Cuban society and the cost of reversing this process will get even higher. Raising interest rate, one of the traditional recipes to reverse dollarization, would be totally ineffective. Even more radical is the option of compulsory conversion of deposits in dollars into domestic currency. This point deserves more attention. Cuban domestic saving is very small. Therefore, the relevant issue would be the prohibition to open new accounts in dollars, instead of conversion itself. As the authorities have allowed the citizenry to open accounts denominated in dollars, the cost attached to an authoritarian measure such as prohibiting deposits in dollars, would be unbearable for a democratic regime. For every Cuban citizen, the U.S dollar has become something highly coveted. Access to dollars allows Cubans to alleviate their precarious economic situation and escape the society´s basement, sadly reserved for those who do not have relatives abroad or any other way to obtain dollars. The lifting of prohibitions on the population to hold dollars was somehow seen by the average Cuban as a triumph over a government historically reluctant to make even the smaller concession. The authorization to hold dollars opened to Cubans the doors of the dollarized network and other places usually reserved for tourists and members of the elite. It is absurd to believe that the Cuban people would embrace the idea of reverting dollarization in order to guarantee and protect the monetary independence of the nation. For Cubans, holding dollars is the true independence, so taking away the U.S. currency would be unacceptable. What happened in Cuba after the tragic events of September 11th can help us to figure out the implications of a compulsory conversion of dollars into Cuban pesos. Fears spurred by the attack stormed the exchange rate market and the price of the dollar went up from 22 to 27 pesos.12 What would happen if there were rumors that the government would again forbid the holding of dollars by the Cuban citizens? Speculation, black market and illegal traffic of dollars would return. In spite of the absence of economic and political relationships with the U.S, the flow of money, information and people between both countries is intense. It is plausible to expect tighter ties even in the short run, so any compulsory measure in the exchange rate field will be unlikely to succeed. Another crucial factor is the link between dollarization and inflation. When the economic agents have the choice to shift from domestic to foreign currency at low cost, money demand becomes more elastic.14 Therefore, the inflation rate maximizing seigniorage in dollarized economies is higher. Moreover, there is enough empirical evidence on inflation turning more volatile in economies with currency substitution.15 It is clear that hardly any benefit should be expected from inflation in Cuba. What would be the main obstacles to maintain and complete dollarization in Cuba? Finding a lender of last resort is the greatest challenge. To solve this problem, some economists suggest an agreement with the monetary authority of the country issuing the utilized currency. The latter would mean that Cuba should enter into an agreement with the U.S. Federal Reserve. But the Fed has rejected the role of lender of last resort to other countries and banks, so this problem remains a great concern. The fact that the Cuban economy is considerably smaller than other Latin American economies like Mexico and Argentina, and the need for the U.S. to react to the growing influence of the euro, might make easier to overcome misgivings from the U.S side. A possible option to ease this problem is to impose larger reserve requirements and longer maturity terms over bank deposits. Foreign banks undoubtedly will play a key role in the future Cuban banking system. Hence, branches confronting liquidity problems could rely on their headquarters, at least partially, to help them through difficult times. One of the main objections against dollarization is that it constraints the scope of policymakers to play an active role in the economy. But the question is how large would such scope would be in any event? It is clear that even in the best possible scenario, Cuban policymakers would be have a small range to maneuver. A factor to take into account is the absence of the money demand history needed to make decisions and undertake monetary policy. A second factor is the problems that will surely arise in forming a staff capable of designing, championing and carrying out the policy. Notwithstanding the commitment of the future administration to democracy and a market economy, it will have to work in a country marked by more than half century of authoritarian regimes. Executing an exchange regime—whether floating or fixed—where the central bank enjoys discretionary power, also affordable to the government, would complicate the extremely hard task of building a democratic society. In such a frail political context, the classic problem of dynamic inconsistency tends to get worse.17. A quick review of history immediately reveals that the independence of central banks rarely occurs in countries with new and weak democracies. It is only after suffering financial crisis and bitter lessons that this independence is reached. Even if it arises from democratic elections, the future government of Cuba will have to go through many setbacks to take on the heavy burden of repressing dollarization and building a sound and independent monetary authority. Flexible exchange rates are seen as powerful tool to soften adverse shocks in external trade. This feature might be very important in larger economies with high volatility in exchange terms, which is not precisely the Cuban case, where the radical transformation of the export sector has laid the ground for sustainable growth. Tourism is a superior good with a clear upward trend over time. This sector is not exempted from fluctuations, but not as much as sugar, Cuba’s main export until the past decade. Of course, there still remains vulnerability stemming from the need for imported oil. But the U.S. is also an oil importing country, so any measure taken by this country to reduce oil prices will also benefit Cuba. Although Cuba and the U.S. have no diplomatic relations and the U.S. embargo has not been lifted yet, the Cuban economy shows clear signs of moving along with the U.S economic cycle. Every effort by the U.S. to reactivate its economy will have positive, indirect—but remarkable—repercussions on the Cuban goods and services export sectors. The only advantage of a flexible system, if any, is as tool to bolster competitiveness. But we do not believe this is the best way for Cuba to seek competitiveness. In a country with a good potential for growth and a well-educated labor force—although not as much as the Cuban government boasts—productivity gains should be sought through a reform program aimed at achieving better resource allocation and providing incentives to private sector. Notwithstanding the protracted macroeconomic stability enjoyed by Cuba, dollarization has not cast any sign of reversion. The creation of the Central Bank in 1997 has not prevented the dollar from spreading throughout the economy. The state monopoly over the economy is a very important factor explaining the coexistence of two currencies, as the Cuban peso is just left to play the role of shock absorber. The power to fix prices and salaries enables the government to have income in dollars and expenditures in Cuban pesos. So why should it end a practice that only yields benefits? The time when the collapse of the current political system seemed imminent is gone. The authorities have succeeded in jumping off from the Soviet ship and boarding a western one, with the dollar becoming a useful vehicle to dismantle the legacy of the former Soviet Union. The expansion and deeper rooting of the U.S currency throughout the economy will go on as long as the current political system lasts. Sooner rather than later, Cuba will take the path of democracy and market economy. When this happens, the U.S currency will be an inseparable part of the economy and society, and the best choice left to the new authorities will be to complete the process begun by the communist authorities and dollarize the entire economy. 1. Economic Comission for Latin America (2000), La Economía Cubana: Reformas Estructurales y Desempeño en los 90, México, Fondo de Cultura Económica, p. 171. 2. ECLA, La Economía Cubana, p. 166. 3. Kildegaard and Orro (1999). 4. It is noteworthy that the term dollarization means the use of a foreign currency to carry out the three functions of money: mean of exchange, unit of account, and store of value. Dollarization is usually mistaken for currency substitution, which only refers to the use of a foreign currency as mean of exchange. Although currency substitution is often the last stage of dollarization, the opposite ocurred in Cuba: accounts in dollars are still very unusual. 5. ECLA, La Economía Cubana. 6. This statment is based on the personal experiences of the author during his regular visits to Cuba since 1997. 7. For insights on the history of currency boards, see Hanke, Jonung and Schuler (1993). 8. It is clear that confiscation is by far more costly than faulting on debt. The first choice entails many political and economic costs unbearable for the government. 10. See Summers (1999), http://www.senate.gov/~banking/99_04hrg/042299/summers.htm. 11. Calvo and Vegh (1992). 12. This is not official information. It was provided to the author by relatives and friends living in the island. 13. See Karaken and Wallace (1981), and Girton and Roper (1981). 15. Calvo and Vegh (1992).